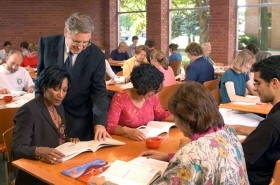 Applied Scholastics International offers Educator Institutes to instruct educators in the techniques of how to create classrooms of confident, self-motivated, lifelong learners. Educator Institutes provide workable methods of reaching unmotivated students and address real classroom situations with real solutions. Learn systematic, research-based methods to drive continuous improvement, ensure proficiency and provide subject mastery. Discover powerful teaching techniques to elevate student achievement, motivation and accountability. Learn about strategies for repairing student talents in reading, math and science. Teaching children of any learning speed. And most importantly, making students active participants instead of passive recipients. Contact us for a schedule of our special Three-Day Educator Institutes.